Public Commons: Document: How do I have a campfire in a Toronto City Park? Current display: How do I have a campfire in a Toronto City Park? How do I have a campfire in a Toronto City Park? Establishing a campfire site for community use. Talk to other park users, who might also be enthusiastic about cooking over a campfire. Talk about some things you would like to try out, recipes and what tastes best over a wood fired grill. Gather email addresses and phone numbers and start an email chain to draw in more campfire enthusiasts. Maybe someone in the neighbourhood will have a trivet to lend or other useful outdoor cooking equipment. Work out the best spot in your park for the campfire, making sure that the site will work for park users (good access to water, sand, and wood storage; picnic tables and benches nearby; easy to get to by bike, car, or TTC; good visibility for other park users). A campfire in a city park is not a common sight, and will likely draw folks over to you - so be prepared to swap stories and ask neighbours to bring extra food to share. Ask to meet with the Recreation Supervisor to get the process started. If No call or e-mail back after five days: e-mail the contact list, and let them know you’re going to call your councillor to get her/his help. If you have not been able to get a meeting set up, or if the Recreation supervisor says "no, campfires are not allowed," contact other supportive park users and ask them to send the campfire request separately. Five separate e-mails make an impression; ten create a stir. Once you are in the meeting, lay out your idea and ask the Recreation supervisor to contact her/his colleagues to set up a site meeting. Take a friend: Make sure that the set meeting is at a time of day that is suitable to you and at least one other supportive park user. That way you can make sure nothing is forgotten afterwards. If you can find a campfire-maker to come along, from a park that already has campfires, that can be a big help. (It means that people at the site meeting can discuss real experience instead of only hypothetical scenarios). If there's any doubt about getting permission, make sure that your councillor is at the site meeting as well, or one of her/his assistants. Be prepared to have an alternative location, but stick to what works best for the park users – e.g., if the site is too far from the playground or washrooms, it will be harder for families to stay. There are lots of ways to get around turf damage, i.e., so that you can have a ‘no-trace” campfire on the grass (a half barrel on bricks will work for the first of “pilot” campfires). The general rule about distance to other structures/trees overhead is a minimum of 10 feet. Recreation Supervisor: Be sure to emphasize the need for a Recreation staff to meet you at the beginning of the campfire and to check back frequently, for the first fire. They’ll need to be around to help get water and facilitate your use of other park resources. Community campfires work best as recreation programs; they run with the help of volunteers but are integrated into the staff’s work. Remind the others at the site meeting that collaboration does not necessarily require the physical presence of the staff after the first time, but it needs good contact. "Campfires as eyes on the park. ": a link to the "Campfires" page on dufferinpark.ca, which tells how campfires are booked and run at Dufferin Grove Park. 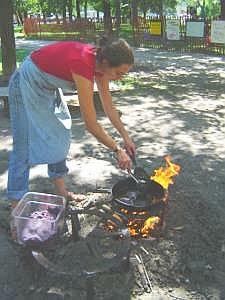 The Campfire Handbook: Stories about park campfires at Dufferin Grove, and recipes too. The text is a collaboration between city staff and campfire users. Safety Checklist, October 2010: the city's rules for campfires in parks.